Testing Season 2019! Wisconsin Forward Testing March 18-April 23 for Grades 3-8. Testing in ELA, Math and in 4th and 8th Social Studies and Science. ACT Aspire testing for 10th graders-One full day of testing Sophomores Last names-A-K Tuesday, April 9 Sophomores Last names L-Z Thursday, April 11 Small group sophomores Friday, April 12 ACT Aspire testing for 9th graders-One full day of testing Freshman Last names A-H Tuesday, April 23 Freshman Last Names I-Z Friday, April 26 Small group-Freshman-Monday, April 29 We thank you for encouraging students to work hard, concentrate and show their skills. We have completed ACT and ACT WorkKeys for all juniors. We will strive to continue our success and show our #HornetPride. Student learning is measured by assessment. 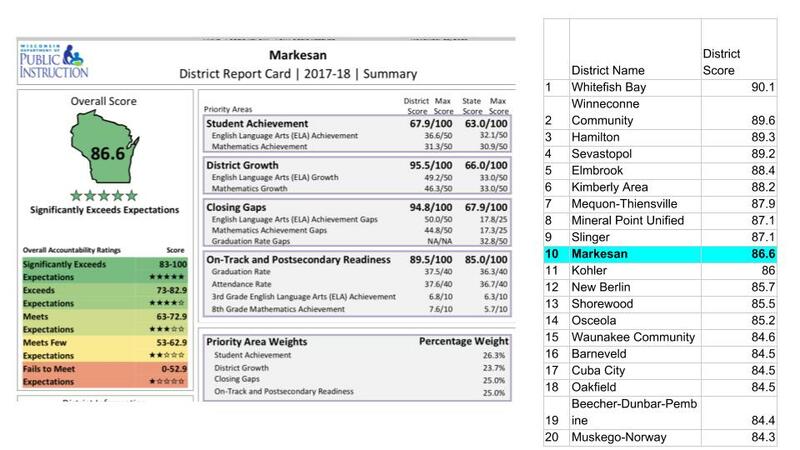 Markesan District Schools assess for both local and state-mandated assessments. All students will grow reading stamina and comprehension skills by applying critical literacy skills and strategies to read and analyze texts, including text with graphics and interactive elements. Educating Every Student Every Day Markesan District Schools work to educate every student every day. Our lessons, curriculum, and assessments are designed to help each student grow and achieve. Teachers dedicate time and talent to planning for student needs. Inservice time is devoted to studying student needs, through both data and observation, and taking actions through plans and programs, to work for the success of every student. The Markesan District Curriculum is aligned to the Wisconsin State Standards. Click here to access the list of standards for the Markesan District Schools. We continue to work to develop lessons and units that help students meet standards, grow future-ready skills and prepare to "transition successfully" to their next step in the learning journey.